When you open up any business the first thing you see is the Dashboard screen. The last icon in the top right corner is the create icon, which let you create invoices, expenses, transfers, and adjustments. On the dashboard itself, you can see that there are three different dashboards, as indicated by the dots. On the left, you can access the Income, Expenses, Banking, Accounts, and Reports screens. The first dashboard shows you the Profit and Loss Overview. 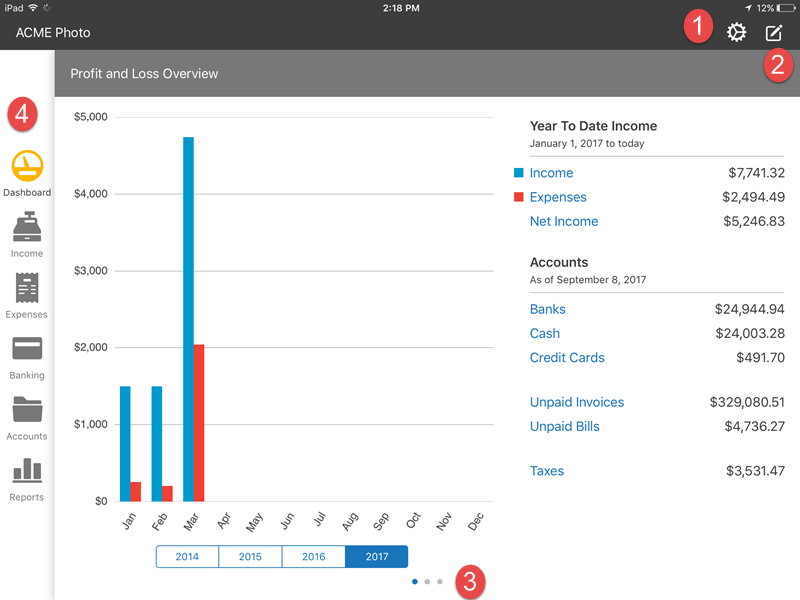 You can see what your income and expenses are as well as the balances of your main accounts, such as your bank accounts. You can tap on any of the accounts on the right-hand side to access additional information. If you swipe left, you will be able to see the Income Overview. 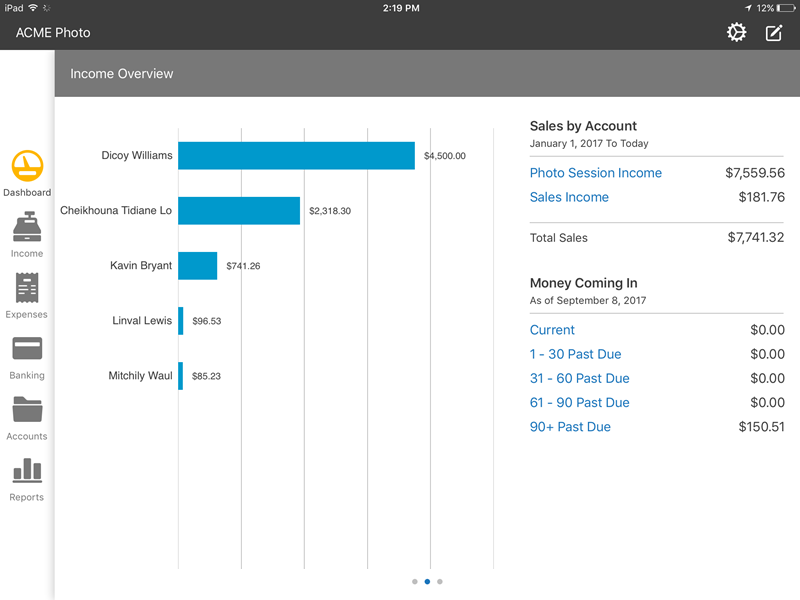 This shows your Sales by Account & Money Coming In (also known as your Unpaid Invoices). The graph displays sales by customer. You can tap on any of the customers or accounts on the right-hand side to pull up additional information. Swiping to the left again reveals the Expense Overview dashboard. 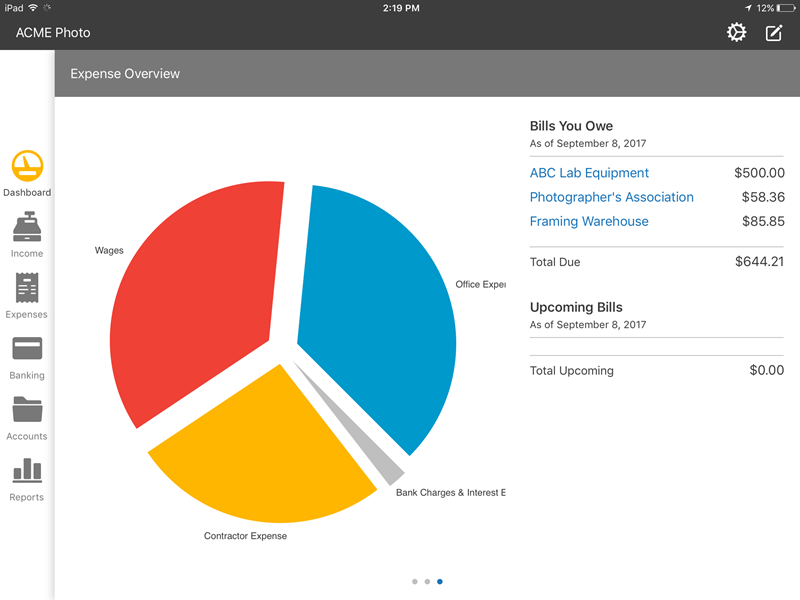 The pie chart displays your largest expenses and the right-hand side will show you Bills You Oweand Upcoming Bills. Bills You Owe are bills that you have to pay right away because they’re either due or past due. Upcoming Bills are bills that you still have time to pay.